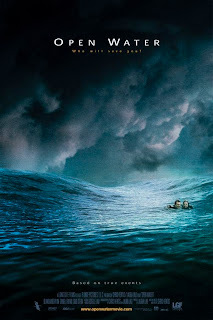 I like a thriller like anyone else, but when this movie first came out in 2004, I dismissed it as your typical "Jaws" remake and didn't see it despite the accolades from the Cannes film festival and others. However, I happened to catch most of it last weekend while channel surfing, and became instantly intrigued, even giving up my favorite Food Network show with Nigella Lawson. By the last few minutes, my heart rate was pounding, I was glued to the screen, and I was making internal promises to myself not to sign up for any diving excursions, not that I was about to. Afterwards, I looked up some background info on the film and was further captivated the fact that it was based on the true story of a couple, Daniel Kintner and Susan Watkins, played by Daniel Travis and Blanchard Ryan, who vacation together in the tropics to have some "me" time, only to be met with "shark" time. Due to an accident in the head count, the couple are left behind on a group dive, in what turns out to be shark infested waters. In between being sitting ducks for one pesky shark that spends much of the film encircling them, with lots of shots of the ominous grey dorsal fin, protruding teeth, and other sharklike moments I won't go into because really, they're just plain gross. All the worst things you might imagine happening actually do, but they are well time and interspersed with some interpersonal squabbling, ie. "this was your idea," - "no, it was your idea..." which allows the viewer a moment to stop sweating and unclench their teeth. The dialogue is well written and rings true - that is, if I were stuck with my loved one in shark infested waters, I might start to pick a fight just for diversion's sake. The director, Chris Kentis, used real sharks for this one (no mechanical ones here), and you can really tell- -particularly in one nighttime storm scene, which is as good as any sequence from a Hitchcock thriller. The movie is also notable for capturing authentic shark behaviors. The only nonauthentic part of the movie was Susan's hair, which despite days of dehydration, starvation, and hallucination, manages to remained perfectly coiffed, as if she had a hairstylist floating nearby in the middle of the south Pacific. Hi Carrie - you have such a variety of information here. I hadn't heard of this movie (not unusual as I'm not a movie watcher) but this one sounds like one to watch for. I just saw this movie. Anyone expecting mindless explosions,gore, CGI, heroic in-the-nick-of-time actions or someone making a bomb from nothing better stick with Jaws 3. You'll be much happier. This movie was real, from the ocean to the sharks. It took me right in the middle of the ocean with this couple, and I felt their emotions, all the way from annoyance to final terror and hopelessness.